Lower Culand pit is designated as a RIGS because it provides access to a key interval in the Lower Chalk rarely exposed between the Kent coast and outcrops north of the Thames. It has produced fossils from the early 20th century and retains its importance as a fossil collecting site. The site also has good educational potential. Lower Culand is part of a network of Chalk RIGS in the Medway Valley. 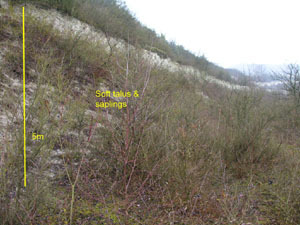 It is part of a complex of chalk pits that extend to the top of the scarp face of the Downs at Burham northwest of Maidstone. Although the pits extend right through the chalk sequence this RIGS is concerned only with beds within the Lower Chalk. 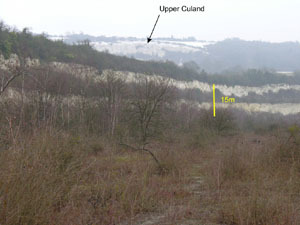 The northwest face of Lower Culand pit, although rather obscured by talus, provides the only exposure of the top of the Chalk Marl and the overlying Grey Chalk available in the Medway Valley. 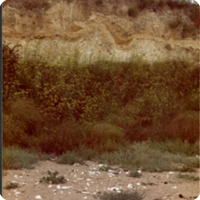 The sequence contains various fossiliferous beds, one of which (the Entolium Bed) has yielded the type specimen of Turritella dibleyi and contains 25 other species known from no other locality. This bed is known to be the equivalent of the Tottenhoe Stone, an important condensed bed that lies above the eroded top of the Chalk Marl, north of the Thames. At Culand lesser erosion is seen below the Entolium Bed. Lower Culand Pit was surveyed for designation as a RIGS in December 2005. Permission to visit must be obtained from the Kent Wildlife Trust. Pedestrian access is relatively easy via a narrow stepped path and tunnel. The nearest parking is in Eccles or Burham. The quarry faces are vertical and hence there is the risk of falling debris but the faces are relatively low, mature and stable. The quarry floor is uneven under foot.